This chapter deals with energy consumption issues in wireless networks. In such networks, energy is a scarce resource and, hence, it must be used efficiently. Under these circumstances, we consider two interesting combinatorial optimization problems: Minimum Energy Broadcast Routing and Cost Minimization in Multi-interface Networks. The goal of the first problem is to perform broadcasting from a given source while minimizing the overall energy required for communication. The second problem refers to the choice of activating a set of available communication interfaces at the network nodes in order to satisfy the required connections in a wireless multi-interface network with minimum total cost. While Minimum Energy Broadcast Routing has been studied extensively during recent years, Cost Minimization in Multi-interface Networks is rather new. For both problems we survey recent complexity results and approximation algorithms under different assumptions. 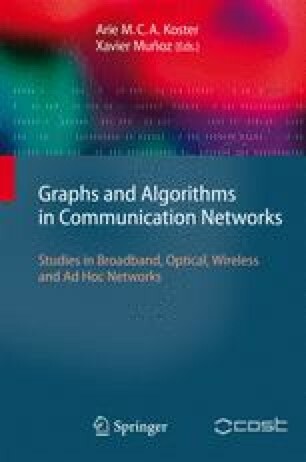 The research was partially funded by the project “CEPAGE” of INRIA (France), by the ANR–project “ALADDIN” (France), by the European Commission under Integrated Project “Algorithmic Principles for Building Efficient Overlay Computers” (AEOLUS), EU COST action 293 – Graphs and Algorithms in Communication Networks (GRAAL) – and EU COST action 295 – Dynamic Communication Networks (DYNAMO), by the Greek General Secretariat for Research and Technology under programme PENED, and by a “Caratheodory” research grant from the University of Patras.